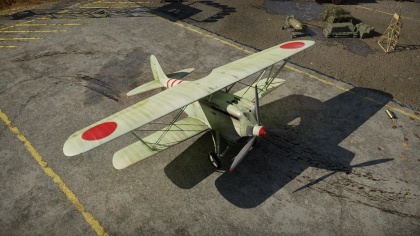 The Ki-10-I is a Rank I reserve Japanese biplane fighter with a battle rating of 1.0 (AB/RB/SB). It has been in the game since the start of the Open Beta Test prior to Update 1.29. The Ki-10-I is a reserve biplane fighter for Rank 1 Japan. Like most biplanes, the KI-10-I has a low top speed, good turn rate, good-to-fair climbing ability, nearly no armor, and, in realistic and simulator battles, a ridiculously short take-off length. 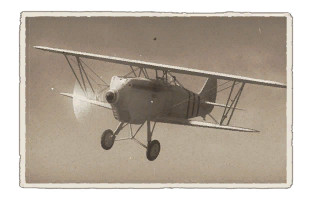 Compared to other biplanes, the Ki-10-I is faster and climbs far better, but in turn has inferior armament and armor. The Ki-10-I's low speed and tight turning ability makes it a great turn-fighter, like most Japanese light fighters. The Ki-10-I excels at low and slow turn fighting at very low altitudes where enemies cannot out-dive it. Additionally, it has the climb rate to climb away from enemy biplanes. Very fast dives should be avoided, as the wings will shear off at very high speeds. Similarly, turning stalls should be avoided, as the Ki-10-I has a tendency to enter uncontrollable spins. It's twin 7.7 mm armament is the weakest in the game, as it has a lower fire rate than its contemporaries, the ShKas, Browning, and MG-17. The belts are poor as well; stealth is most recommended, as it has the most AP-derivative shells. Strafing attacks on all but the least armored targets are not recommended; Artillery, Vehicles, and Landing Craft are good and soft targets, while the Ki-10-I's weak construction makes attacking AAA and bombers risky. All bombers are pretty much invulnerable to the Ki-10-I (Beaufort, A-26, etc. ), unless you are extremely good at making consistent pilot shots. Cargo Ships, Tanks and pillboxes are also invulnerable to the Ki-10-I. Instead, the best Ki-10-I targets are other biplanes or slow monoplanes, such as P-26s, Fury Mk Is or Nimrod Mk Is. AIM FOR THE WINGS! The fuselage's of all planes will absorb your shells like a sponge. Like most other planes, the Ki-10-I works best in numbers. Ki-10 pilots should focus primary on sticking together and working as a team. The 2 x Type 89s are the absolute worst pair of guns in the game. They have little incendiary ability, like the Browning 7.62 mm/12.7 mm, and have a low fire-rate unlike the MG-17. The Ki-10-I will not provide rapid kills; it takes much skill to master the Ki-10-Is killing capabilities. Beginner players will not appreciate the Ki-10-I at all. Always aim for wings of opponents. A wing will simply fall off after you have unloaded 500 rounds into it. If you're lucky, you can get away with a wing kill after about a 5-8 second burst. Pilot shots are viable as well, but require a significant amount of discipline and skill. Remember that the Type 89 also tends to overheat quickly, though slower than the ShKas. Always use the Stealth belt. Its efficacy is superior to any tracer-equipped belts. For such low tier vehicles the order of research does not really matter. Improvements in firepower by new belts and new machine guns help a lot in arcade battles. For realistic mode, performance upgrades are more often necessary. The Kawasaki Ki-10 was the last Biplane fighter used by the Japanese Army. Introduced in 1935, it beat the competing Nakijima K-11 (which would later be refined as the Ki-27) as the Imperial Japanese Army Air Force placed more priority on maneuverability than speed. Its excellent maneuverability made it extremely popular with Japanese pilots, who demanded similar high maneuverability from newer aircraft. Over the course of its service the fighter would be refined several times with the ultimate version, the Ki-10-II, appearing in 1937. The K-10 saw service against Chinese air forces in the early stages of the Second Sino-Japanese War and against Soviet air forces during the battles of Khalkhin Gol (where it historically outperformed the Soviet I-15). It formed the backbone of the IJAAF fighter forces until 1940, but it was considered obsolete by Western military experts as early as 1938. By the start of the Pacific War, the Ki-10 had been relegated to training and courier roles, and received the Allied reporting name "Perry". There are no known incidents where the Ki-10 engaged American- or British-crewed aircraft, though the Japanese fighter did fight Chinese National P-26s, and may have engaged British-built Gladiators, Italian CR.32s (predecessor of the CR.42 ), and Soviet I-15's, all crewed by Chinese pilots, during the early battles of the war. A biplane of composite structure with non-retractable landing gear and an open cockpit. This plane was created in the design bureau of Kawasaki Heavy Industries under the direction of Takeo Doi. While the new fighter was being designed, experience and structural solutions were used from the Ki-5 monoplane fighter developed earlier. The designers, headed by Takeo Doi, managed to create quite a successful aircraft with good flight performance. The Type 95 fighter got off the ground for the first time in February 1935, and it reached a maximum speed of 400 km/h during tests. At the time, this was probably the fastest speed attainable by a biplane. The aircraft was launched into full-scale production under the designation of ""Army Fighter Type 95 Model 1"" (Ki-10-I). A total of 300 fighters of this variant were supplied by the Kawasaki company from December 1935 to October 1937. The aircraft was equipped with a 850 hp Kawasaki Ha-9-IIa twelve-cylinder, double-row, liquid-cooled engine that featured a gear-driven centrifugal-type supercharger and a three-bladed, controllable-pitch metal propeller. The engine itself was a licensed version of the German BMW9. The Ki-10's fuselage was a semi-monocoque with stressed duralumin skin panels overlapping each other. This technology made assembly easier, but the joints had to be puttied and covered with a thick layer of paint and lacquer to reduce friction resistance. As a result, the external finish was so thick that one could not see any of the duralumin sheets' joints, even when standing quite close. All of these machines were produced with drop-shaped wheel fairings, but these were usually removed when the plane was operated on temporary airfields. The plane's armament consisted of two synchronous 7.7 mm Type 89 (Vickers system, heavily upgraded) machine guns with 450 rounds each. These guns were mounted over the engine. The trigger button was placed in a very original location, not on the aircraft control stick but on the throttle. The aircraft's instrumentation and on-board navigation lights enabled the Ki-10 to perform night flights. Provision was made for the installation of an oxygen apparatus. Command vehicles were equipped with radio sets. Externally, these fighters could be identified by the radio antennas mounted over their biplane cellules. HistoryOfWar.org's page of the "Kawasaki Ki-10 'Perry'"
This page was last edited on 10 March 2019, at 19:07.